Regular intake of calcium and collagen everyday is the key to prevent and treat calcium and collagen deficiency. Calcium and collagen is essential in helping to build and strengthen our bones and fortified our tendons and cartilage respectively. As we age, we require calcium, collagen and certain minerals as supplements due to our imbalance diet and that our body can no longer produce enough quantities for the body to repair itself. As a consequence of this our body begins to deteriorate giving rise to health problems such as “brittle” bones and joints discomfort. It is vital to supplement food with calcium, collagen and minerals. Why do we require Calcium and Collagen? Calcium is found mostly in our bones. Our food intake provides us with calcium. Calcium provides nutrients for our heart to beat and muscles to function. Our bones are constantly eroded throughout our life and are replaced with new bone tissue. If our diet is calcium deficient, our calcium needs for proper body function is taken from the bones. Our bones will degenerate if calcium is not replaced and hence lead to health problems such as brittle bones or osteoporosis. The cartilage between our joints is mostly made up of collagen. The cartilage acts as a cushion between our joints as we move. Having a healthy cartilage is important to ensure healthy joints where we can have unrestricted movements without discomfort. Over many years, people throughout the world have discovered and enjoyed the benefits of seaweed, either in food, health products or natural therapies. The seaweed is well known for its abundance source of calcium and other trace minerals which the body needs. Seaweed is one of the richest plant sources of calcium. The calcium from K-OsteoCal is derived from seaweed harvested from the sea. 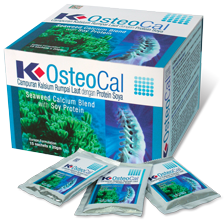 K-OsteoCal originates from seaweed that absorbs essential minerals and nutrients from the sea. It contains a broad range of minerals and collagen that assist in developing bones, maintaining healthy joints and enhance calcium absorption. Magnesium, which builds and strengthens the soft centre of the bones onto which minerals adhere to. It also contains Boron that helps to enhance calcium absorption. Together with Copper and Zinc, they play a role with Enzyme co-factors to build up and cell division of bones. It has higher bioavailability and better calcium absorption than calcium carbonate and tricalcium phosphate.